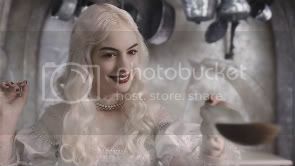 In the latest film version of Alice in Wonderland, actress Anne Hathaway glides across the screen as the White Queen with a pearly grin that becomes a bit unsettling -- because it really appears to be somewhere between Glinda the Good Witch and The Stepford Wives, and according some folks...well-known British culinary queen, Nigella Lawson (pictured above). In any case, Burton, who previously said that the Red Queen has a bit of Leona Helmsley in her, said Lawson's domestic goddess routine has an eerie edge to it at times. 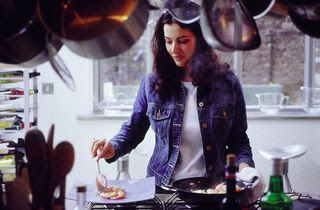 "She's really beautiful and she does all this cooking," he goes on, to say "but then there's this glint in her eye and when you see it you go, 'Oh, whoa, she's like really ... nuts.' I mean in a good way. Well, maybe. I don't know." Anyway, take a look for yourself at the video clip comparison below, and you be the judge.